Think twice before throwing that old toothbrush out. 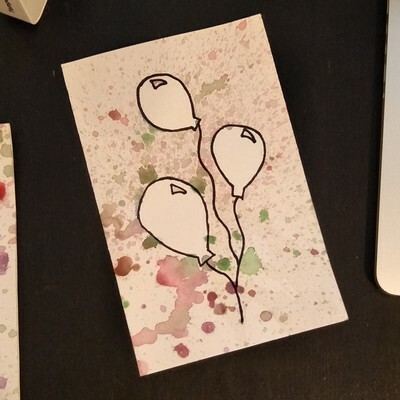 Kids can use them to create fun splatter paint art and in this article I have used the technique to create an easy birthday card that even young kids can make with a bit of help. Watercolour paper is fantastic paper to use with kids as it is so forgiving with excess paint. 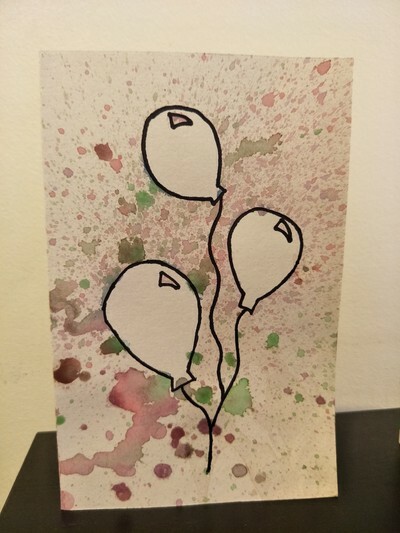 With this birthday card, you can use a black marker to make the design work even if the kids haven't quite managed to get the splattering technique 100% correct. 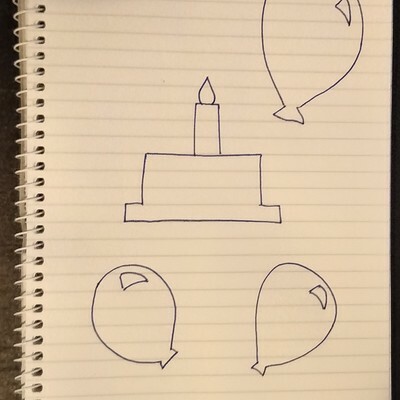 Draw birthday pictures like balloons or birthday cake on some paper like in the picture below. If you want to try your own design, make sure you choose distinctive one-dimensional shapes with not too much fine detail. Make sure you draw the shapes with a pen that will not run with water. Fold and trim the watercolour paper to create a card (make sure it fits into an envelope if using one). Arrange the shapes on the card. Water down your chosen acrylic paint colours in the palette. Use a good dollop of paint with a small dash of water - you are after a watercolour paint consistency. 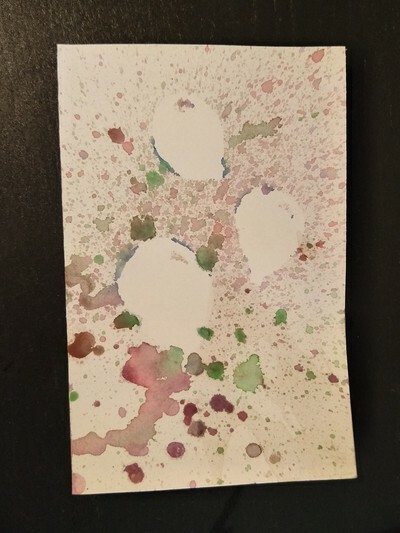 Dip the toothbrush in the watery paint and tap the excess paint off to avoid big splats of paint on the card. Hold the toothbrush over the card and run a finger over the toothbrush bristles to flick the paint onto the card. Repeat the last two steps until you are happy with the effect. Lift the shapes carefully off the card with a toothpick and leave the card to dry. 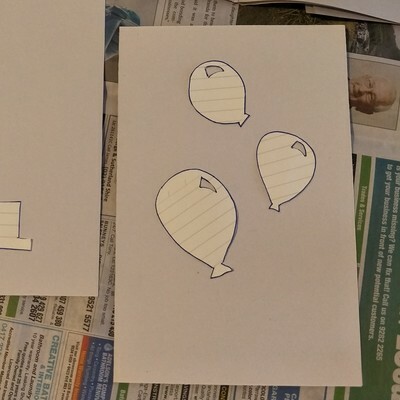 Lift the shapes off before the paint dries and "glues" the shapes to the card. 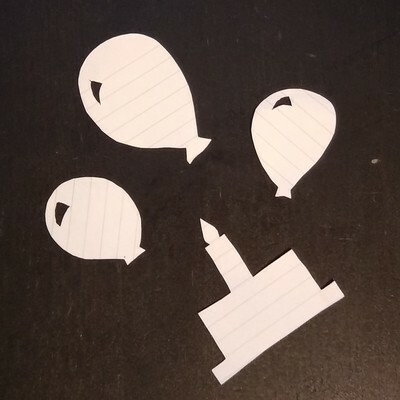 (OPTIONAL) Use a black marker pen if you feel you need to emphasize the design or to add extra details like strings on balloons. Be sure to checkout my Inspirational Quote Style Watercolour Birthday Cards article that uses similar materials to create a different style of birthday card. If you like the idea of splatter painting, My Kid Craft has more splatter painting ideas for you to try with flowers and planets.